Old Crossleyans maintained their unbeaten record in Yorkshire One but their performance in a 27-15 win at Selby lacked the cohesion and continuity which marked the previous week’s outstanding win against Middlesbrough. 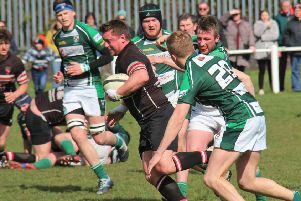 Deprived of possession for long periods of the game, they still scored four well executed tries to earn the bonus point. Selby had a lot of success in the set pieces and were particularly dominant in the scrums, where they pushed the Crocs’ pack around the park. The line out didn’t function as effectively as in previous weeks and, in possession, a series of unforced errors squandered promising scoring opportunities. Crocs still managed to open up a 27-0 lead before Selby came back strongly in the final quarter with three unanswered tries. and Mark Boothroyd started having come off the bench the previous week. Selby took the initiative in the opening exchanges and comprehensively pushed Crocs off their own scrum. A Selby driving maul deep in Crocs’ territory was disrupted by McGill and Joe Gallagher cleared. When Crocs kicked out on the full, Selby’s build up play lacked continuity and rhythm, and Crocs’ hallmark defence nullified Selby’s attacking threat. It was approaching the half hour before the first points were scored when Sweeney landed a penalty from in front of the posts. Ryan Hammond was marauding in midfield to great effect, busting holes in the Selby defence but quality possession was scarce. Approaching half time, Crocs produced two tries of real quality in quick succession. Dunne ran back a miscued penalty deep into the Selby’s half. Joe Stott broke the defensive line and Rob Oliver, up in support, touched down under the posts. Sweeney’s conversion made it 10-0.
outpacing the trailing defenders to the line. Sweeney converted and Selby finished the half attacking but unable to find a way through. Martin Hamer was prominent in the opening exchanges of the second half and, despite having a man yellow carded, Oliver broke down the right and Sweeney took play deep into Selby territory. Crocs stole Selby lineout ball but a promising move was pulled back for a forward pass. The hosts came back strongly and an excellent clearance from Stott was required. The game then became scrappy with unforced errors, penalties and injury stoppages before Jack Hammond carved his way through the Selby defence and shortly after Joel McFarlane turned the Selby defenders inside out before sprinting to the line. The conversion was unsuccessful but Crocs led 22-0 midway through the half. Minutes later the bonus point was secured when Crocs took advantage of a spilled ball following a hoisted kick and effective chase. Billy Hammond still had work to do but touched down in the corner. Any thoughts that this lead would be extended in the final 10 minutes were dashed when Selby finished strongly and scored three unanswered tries. The first was scored by Stephen Clarke following several phases of patient recycling close to the Crocs’ line. Dunne responded with an eye catching run from deep but Ashton Dallimore scored in the corner. Crocs then had a man yellow carded for a deliberate knock on and home wingman Matthew Leetham outpaced the defenders to score in the right corner.